The earth has a lot of secrets and a lot of things that aren’t so secret. This is especially true when it comes to the minerals and metals that it harbors. Some metals and minerals are very common while some are so rare that you may never see them in your life. Below are 5 rarest metals on earth and what they are used for. Iridium – this metal is silvery white in color and rather brittle. It also mixes will with platinum and that is the state when it is at its most workable. Most of the time, iridium can be found in comet or meteorite crash sites. It makes you wonder why there is so much iridium out in space and so little of it on earth but that isn’t exactly true. There is a lot of iridium on earth but because it is so dense, it has sunk into depths that are impossible for people to reach. Better to get it out there than to dig for it here. Indium – if metals were given personalities, Indium would be the crybaby. It’s a softy (literally and figuratively speaking), it is blue on the inside, and even lets out a “cry” when it is bent out of shape. As it happens, indium is a very rare metal that is made during the zinc-ore processing method. In its purest form, it is a white colored metal that is quite shiny and very malleable. Rhenium – this metal is not as well-known as other metals but it is one of the densest metals in the world and has the third highest melting point. Rhenium is a molybdenum by-product which means it is a by-product that comes about when people mine for copper. Osmium – this is one of the densest elements on earth and looks silvery-blue. There is still a debate whether osmium is heavier than iridium. This metal is usually mixed with platinum group metals that are in nickel heavy ores. The trading price for this rare metal is at $380per troy ounce. 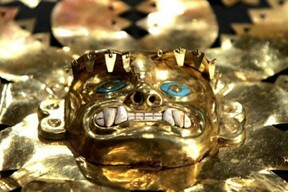 Gold – it is no wonder why gold makes the list. It is not only rare but it is also used in a lot of things and this is why it tends to be really expensive. It is all in the law of supply and demand and when the demand for gold is sky-high and there isn’t a lot of it, you can bet prices will soar through the sky.